The purpose of this article is to summarize a retrospective study that reports the 24-month anatomic and best-corrected visual acuity (BCVA) response after intravitreal bevacizumab as primary treatment for subfoveal CNV secondary to AMD. This is the largest study with the longest follow-up to compare 1.25 mg and 2.5 mg of intravitreal bevacizumab (IVB) in exudative AMD, and there are no studies published on the outcomes of 2.5 mg of IVB in AMD at 24 months. We reviewed the clinical records of consecutive patients with CNV secondary to AMD, who were treated with off-label intravitreal bevacizumab between September 2005 and July 2007 at nine centers from eight countries. Two hundred and seven eyes of 180 consecutive patients with subfoveal CNV secondary to AMD with 24 months of follow-up were included for this analysis (see Table 1). Patients were treated with at least one intravitreal injection of 1.25 mg (124 eyes [59.9%]) or 2.5 mg (83 eyes [40.1%]) of bevacizumab. All patients were evaluated at 1 week, 2 weeks and 1 month after the first injection and monthly thereafter. At 1, 3, 6, 12 and 24 months after the initial injection, ophthalmic examination included optical coherence tomography (OCT). * IVB = Intravitreal bevacizumab; # = Number; n = Number of patients; CNV = Choroidal neovascularization; C = Classic; O = Occult; PC = Predominantly classic; BCVA = Best-corrected visual acuity; LogMAR = Logarithm of the minimum angle of resolution; CMT = Central macular thickness. Patients received reinjections when, in the opinion of the treating ophthalmologist, there was a recurrence or persistence of CNV. Treatment intervals and dose were also at the discretion of the treating ophthalmologist; most ophthalmologists treated at 4 to 6 week interval visits if recurrent or persistent CNV was observed. For statistical analysis, the Friedman test was performed and P < 0.05 was considered significant. 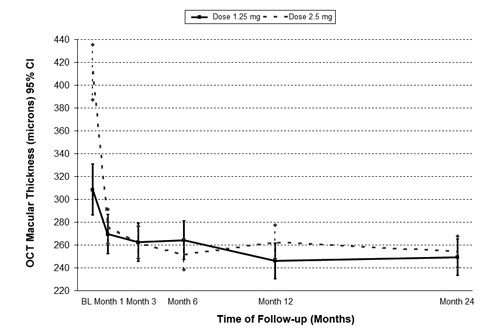 Interval data were analyzed at the 1, 3, 6, 12 and 24-month follow-up time points. Patients' ETDRS BCVAs were transferred from their records and converted to a logarithm of the minimum angle of resolution (logMAR) scale for analysis. Repeated-measures analysis of variance (ANOVA) was used to compare mean values to analyze mean retinal thickness and logMAR visual acuity (VA) statistically. An increase or decrease in BCVA was considered to have occurred if there was a change of two or more ETDRS lines of BCVA. Main outcome measures included changes in BCVA and central macular thickness (CMT) measured by OCT. Within 1 month after the initial bevacizumab injection, improvements in BCVA and CMT measurements were observed and these significant changes continued throughout the 24-month follow-up (Table 2). A summary of the demographics and baseline characteristics of our patients is depicted in Table 1. * BCVA = Best-corrected Visual Acuity; LogMAR = Logarithm of the minimum angle of resolution. At 24 months, BCVA analysis demonstrated that 89 (43%) eyes remained stable, 90 (43.5%) eyes improved two or more ETDRS lines of BCVA, and 28 (13.5%) eyes decreased two or more ETDRS lines of BCVA. These 28 eyes lost two or more ETDRS lines of BCVA due to increased lesion size, subretinal fibrosis, RPE rip, and/or RPE atrophy. When we compared those eyes that received an intravitreal injection of 1.25 mg of IVB and those that received an intravitreal injection of 2.5 mg, we did not observe a statistically significant difference in BCVA between the two groups at any time point during the study (Figure 1). Figure 1. Changes in best-corrected visual acuity (BCVA) between doses of 1.25 (continuous line) and 2.5 mg (doted line) of intravitreal bevacizumab. In the 1.25 mg group, at 1 month BCVA improved from logMAR (logarithm of the minimum angle of resolution) 1.07 to 0.99, a difference that was statistically significant (P = 0.002). 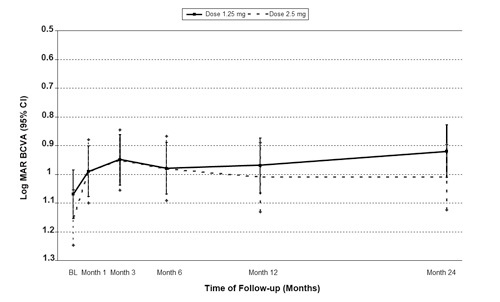 This improvement was maintained throughout the 3, 6, 12 and 24-month follow-up. The mean 24 months BCVA was logMAR 0.92 (P < 0.0001), a statistically significant difference from baseline BCVA. Similar BCVA changes were observed in the 2.5 mg group, at 1 month BCVA improved from logMAR 1.15 to 0.99 (P < 0.0001), a difference that was statistically significant. This improvement in BCVA was maintained throughout the 3-, 6-, 12-, and 24-month follow-up. The mean 24 months BCVA was logMAR 1.01 (P = 0.002), a statistically significant difference from baseline BCVA. CI = confidence interval; BL = Baseline. There was a statistically difference in the reduction in CMT in favor of the 2.5 mg group compared with the 1.25 mg group. However, there was a higher frequency of injections in the 2.5 mg as compared to the 1.25 group (6.61 ± 3.75 vs 4.04 ± 2.25 injections; P < 0.0001) (Figures 2 and 3). Figure 2. Changes in macular thickness with optical coherence tomography (OCT) during follow-up between doses of 1.25 (continuous line) and 2.5 mg (doted line) of intravitreal bevacizumab. In the 1.25 mg group, the mean central macular thickness (CMT) decreased from 308.4 ± 127.52 μm at baseline to 269.35 ± 97.92 μm at 1 month, 262.10 ± 94.81 μm at 3 months, 264.03 ± 97.06 μm at 6 months, 245.91 ± 89.52 μm at 12 months, and 249.27 ± 89.14 μm at 24 months (P < 0.0001). In the 2.5 mg group, the mean CMT decreased from 411.17 ± 111.91 μm at baseline to 276.54 ± 69.35 μm at 1 month, 262.1 ± 65.58 μm at 3 months, 251.73 ± 60.49 μm at 6 months, 262.76 ± 67.86 μm at 12 months, and 254.19 ± 63.93 μm at 24 months (P < 0.0001). CI = confidence interval; BL = Baseline. Figure 3. Sequential optical coherence tomography (OCT) of a 68-year-old woman with 1-month history of loss of vision to 20/400 in her left eye. She was diagnosed with subfoveal choroidal neovascularization (CNV). A) OCT scan before treatment demonstrated a localized fusiform thickening and duplication of the highly reflective external band (retinal pigment epithelium (RPE)/choriocapilalris complex) corresponding to CNV. The retinal map analysis revealed a central macular thickness (CMT) of 273 μm. The patient was offered an intravitreal injection of bevacizumab (IVB) at a dose of 2.5 mg. B) One month after the injection, visual acuity (VA) improved to 20/40. 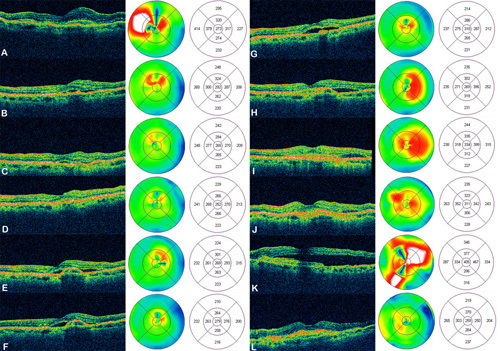 OCT demonstrated improvement of macular architecture with mild residual subretinal fluid (SRF). C) Two months after the injection, VA decreased to 20/50, and the OCT scan showed SRF with a CMT of 265 μm. She received a second injection of IVB at a dose of 2.5 mg at this point. D) Three months after the first injection, the OCT scan shows total reabsorption of SRF and an improvement in CMT to 252 μm, her VA improved to 20/32. E) Six months of the first injection, VA decreased to 20/80, and an OCT scan demonstrated the reappearance of SRF associated with an RPE detachment (PED), and a CMT of 269 μm. She received a third injection of IVB. F) Eight months after the first injection, her VA returned to 20/32 but with only partial resolution of the SRF and PED. She received a fourth injection of IVB. G and H) Twelve and 15 months after the first injection, OCT demonstrated SRF associated with a PED with a VA of 20/40. A fifth IVB was given. I and J) OCT scans at 18 and 19 months respectively, showed significant improvement and almost complete restoration of foveal anatomy. Central foveal thickness was 334 μm and 311 μm respectively, and VA was maintained at 20/40. K) At twenty-one months after the first injection, there was a decrease in VA to 20/200, and OCT showed central elevation with loss of the foveal contour with reappearance of SRF associated with diffuse thickening of the RPE/choriocapillaris complex in the area corresponding to CNV and subretinal fibrosis with a CMT of 405 μm. At sixth IVB injection was given at this time. L) Twenty-four months after the first injection, VA improved to 20/160 and OCT showed improvement in CMT to 259 μm with complete reabsortion of SRF and normalization of the foveal anatomy. The external highly reflective band (including the RPE/choriocapillaris complex) demonstrated a fusiform thickening corresponding to subretinal fibrosis. In the 1.25 mg group, there were no systemic complications. Ocular complications included uveitis in 1 (0.8%) eye, endophthalmitis in 1 (0.8%) eye, cataract progression in 1 (0.8%) eye, and transient increased intraocular pressure in 1 (0.8%) eye. In the 2.5 mg group, systemic complications included 2 (2.6%) new cases of arterial hypertension, one (1.3%) stroke, and one (1.3%) death. Ocular complications included uveitis in 1 (1.2%) eye, endophthalmitis in 1 (1.2%) eye, and an RPE rip in 1 (1.2%) eye. Limitations of our study include that it is a non-randomized, uncontrolled, retrospective study, with a limited number of patients. However, the results were very promising and suggest the need for further investigation. In summary, IVB at doses of 1.25 mg or 2.5 mg as primary treatment for CNV secondary to AMD is associated with improvement in BCVA and CMT at 24 months. We identified no difference in BCVA outcomes between IVB at doses of 1.25 mg or 2.5 mg. The significant difference shown in the reduction in CMT between the two groups may be related to a higher retinal elevation at baseline in the 2.5 mg group. There were more systemic complications noted in the higher dose group and, unless data to support improved efficacy for the 2.5 mg dose becomes available, we favor the lower dose. The authors have no financial or proprietary interest in any of the products or techniques mentioned in this article. Supported in part by the Arevalo-Coutinho Foundation for Research in Ophthalmology, Caracas, Venezuela. D'Amico DJ. Diseases of the retina. N Engl J Med 1994;331:95-105. Ferrara N. Vascular endothelial growth factor: basic science and clinical progress. Endocr Rev 2004;25:581-611. Michels S, Rosenfeld PJ, Puliafito CA, et al. Systemic bevacizumab (Avastin) therapy for neovascular age-related macular degeneration twelve-week results of an uncontrolled open-label clinical study. Ophthalmology 2005;112:1035-47. Arevalo JF, Fromow-Guerra J, Sanchez JG, et al. Primary intravitreal bevacizumab for subfoveal choroidal neovascularization in age-related macular degeneration: results of the Pan-American Collaborative Retina Study Group at 12 months follow-up. Retina 2008;28:1387-94. Modarres M, Naseripour M, Falavarjani KG, et al. Intravitreal injection of 2.5 mg versus 1.25 mg bevacizumab (Avastin) for treatment of CNV associated with AMD. Retina 2009;3:319-24. Presented in part at the Joint Meeting of the American Academy of Ophthalmology and the Pan-American Association of Ophthalmology, San Francisco, CA, October 2009. The complete paper is in press in Ophthalmology 2010. *For a complete listing of participating members of PACORES see http://aaojournal.org. Now more than ever before, ophthalmologists are required to think as an MD and a CEO. The right balance of clinical and practice management skills is critical for a practice to flourish. Each month only one publication delivers the essential strategies needed to navigate and grow today’s ophthalmology practice. Led by Chief Medical Editor Larry Patterson, MD, Ophthalmology Management provides all the tools ophthalmologists need to succeed, bringing them the latest practice management pearls, clinical advancements and medical economics they need to help their practices grow.